Compared with the 240 or so million years that went into its geological development, for Palo Duro Canyon a mere half century amounts to a passage of time thinner than a rustling cottonwood leaf. But to all the people currently or at one time associated with the canyon’s annual summer Texas pageant, 50 years is a big deal. As of this summer, Texans and out-of-state visitors have been coming to enjoy the evening musical drama in the canyon’s amphitheater for five decades. 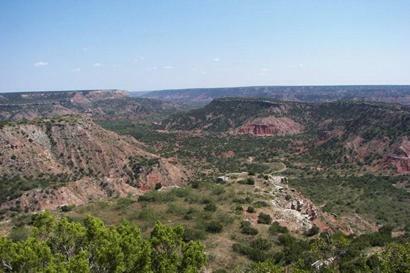 Palo Duro, second only to the Grand Canyon in size, began with the erosional force of the Prairie Dog Fork of the Red River long before recorded history. The Texas outdoor musical traces its genesis to an article in Reader’s Digest. In 1960, Margaret Harper happened to read an article in Reader’s Digest about a North Carolina playwright who specialized in telling the story of a particular area through outdoor musical dramas. Paul Green had been awarded a Pulitzer Prize in 1927 for his play, “In Abraham’s Bosom.” Later in his career, he developed a new style of theater that came to be called symphonic drama. Writing scripts based on historical happenings, he used a mix of music and pageantry in an outdoor setting to tell a story. After reading about Green and his work, Mrs. Harper started thinking about an outdoor pageant in the sprawling canyon south of Amarillo, a giant, multi-hued gorge which extends for 120 miles and averages six miles wide. In a time decades before email or even the casual placing of low-cost long distance telephone calls, the Panhandle woman sent Green a letter. That missive marked the beginning of a correspondence in which she strived to convey to Green the canyon’s rich cultural history, which essentially parallels the “modern” history of the Panhandle itself. She talked up the outdoor musical idea with friends and between them, they ponied up the money it would take to get Green to Amarillo so he could see the canyon himself. The Southern writer, like other creative types before and since, found inspiration in Palo Duro’s many-hued geologic pallet, which seems to change colors every time the lighting changes. With Green’s buy-in assured, Mrs. Harper and other supporters formed a non-profit group called the Texas Panhandle Heritage Foundation. Led by Mary Miles Batson with a lot of political help from then Texas Parks and Wildlife Commission member Pete Gilvin, the organization began raising money in 1961 to stage the pageant. An estimated 4 million people have viewed the pageant over the last 50 years. In recent seasons, the show’s three-month run (six days a week with Mondays off) has drawn about 65,000 annually. Though the show is still based on Green’s original script, new characters, scenes and dialog have been added by David Yirak, who became the pageant’s artistic director 10 years ago and has been associated with the production for 17 years. For example, today’s version makes no mention of the early Spanish passage across the Panhandle, and presents Indians in a more politically correct manner than in earlier productions. Another change to the show came because of weather, or the lack of it. In 2011, the extended drought forced cancellation of the pageant’s traditional fireworks display. To replace that, the staff developed a finale using shooting streams of water and LED lighting and powerful projectors to color the night sky. But given good rains the Panhandle received earlier this summer, the fireworks were reinstituted this season in addition to the water and light show. Despite the changes to the show, it begins as it always has, with a lone horseback rider galloping along the canyon rim 600 or so feet above the amphitheater, a powerful spot light illuminating the waving Texas flag. No matter how many times you may have seen that, it still makes you proud to be a Texan.